Start Your Own Inspired Success Circle! We are THRILLED that you are interested in starting an “Inspired Success Circle.” THANK YOU for jumping into this exciting possibility! We’re guessing (hoping!) 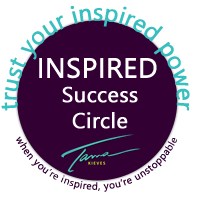 you’ve read Tama’s best-selling book, Inspired & Unstoppable: Wildly Succeeding In Your Life’s Work!, and probably know that she devoted an entire section in the last chapter to starting your own Inspired Success Circle. Thank you for your interest in sharing Inspired & Unstoppable with others. I am thrilled that you enjoyed the book and I am certain that in championing this work, you will strengthen yourself — and you will get to know some of the most amazing visionaries, creative entrepreneurs, soul searchers, freedom-seekers, and business colleagues you could ever hope to meet. Practicing these concepts with like-minded companions can lend your dreams more strength, direction, and assistance. Not to mention… FUN! The suggested format for your group would be to meet for eight weeks with the first week being an introduction week, and then covering one chapter per week. Many groups stay together long-term and just repeat whole process again, starting over once they have finished the eighth meeting. The last chapter of Inspired & Unstoppable (“Where Do We Go from Here”) will also provide suggestions for setting the tone of your group. Just fill out the form on this page to register your Inspired Success Circle and have it listed under “Find An Inspired Success Circle” section of our website. Once you’ve registered, we’ll send your Inspired Success Circle toolkit — the secret handshake we leave to you!